Across town or across the country we have the bus for you. 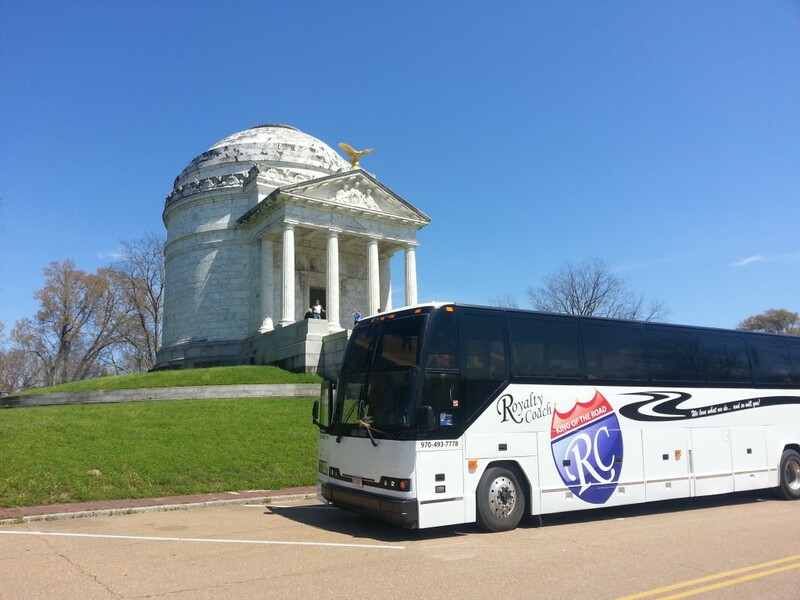 At Royalty Coach we are dedicated to providing a travel experience that ensures your safety and comfort. Beginning with your first contact with our reservation professionals you will discover a commitment to customer service. We are not your typical charter company, each and every member of our staff is committed to making your charter our priority. Putting the family touch in everything we do, you will see this reflected in every move we make. Whether you are planning a cross-country excursion or a corporate event we are prepared to move our staff and vehicles your way. Give Royalty a call and sit back and relax knowing your charter will be handled by our well qualified professionals. We are proud to operate 48 & 56 passenger MCI & Prevosts. "u guys were awesome!!! thank you soooo much!!!" ... with girls age 8-18 we had a synchronized swim competition in Souix Falls, SD. This was the first time we had used Royalty Coach, from now on they will be the only one we use." Thank you for everything, you were amazing. "Thank you for driving our group around South Dakota. You showed a lot of care and patience with our group. Your humorous jokes and good attitude will be missed by all of us." "...you guys did a great job, serving beverages and singing were a nice treat. Thanks so much. I plan to work with you as much as I can. I'll spread the word. If people from other senior centers are looking for a bus." Thank you for organizing and going on the trip to Yellowstone; the experience was awesome and I loved it. You made a huge contribution to the trip and it would not have been the same without you. ...on a 9 day trip to San Antonio on Royalty Coach. We felt completely at ease drivers we have traveled with. Robyn is very capable at making passengers feel at ease and enjoy the trip. We definitely recommend their service. Not only is Royalty Coach providing excellent transportation options, they also have amazing customer service. It's always nice to support a local company that does such an amazing job. I am constantly looking for motor coach transportation for my groups. Royalty Coach has put the other companies to shame with their clean and reliable buses and their phenomenal treatment of customers. I highly recommend their services.
" I just wanted to pass on to you how professional Cinda was, and what a super driver! Very safe and courteous!" "Royalty Coach was wonderful to us. Excellent customer service. We will be using them again this coming year." "...they truly became members of the group participating in cooking, cleaning, hiking and classes. Of course, they kept our children safe ... Without a doubt we will ask for their assistance again! ...the connections Robyn & Mike made with the students beats all!" On behalf of my entire organization I would like to extend to your our sincere gratitude for tonight's services! Your husband and son were our drivers, so awesome, and made the night so easy for me! We will most definitely be using Royalty Coach again we had the best experience! "Mike is very good driver and the bus is well maintained, comfortable with a good ride. This is one of the best tours we have traveled on and a good value too!" ... I've already taken seven trips with them. WOW! I've got three more trips planned, this year. They put together the most fun adventures Ever!! Mike and Robyn make 'Everyone" feel like a VIP! I feel safe seeing the country while Mike is doing the driving. Great job and kudos, Royalty Coach Rocks!!! What a great trip!! We had a wonderful time and came home pleasantly exhausted. The bus was clean and comfortable. Vince is a great driver and did a marvelous job of being available whenever we needed him and anticipating our needs. The team enjoyed his company and his driving skills. I will heartily recommend Royalty Coach to anyone I know who needs transportation. A word of thanks to you for letting us all meet Ryan on our recent Cripple Creek trip. Ryan was very professional, attentive to everyone's needs, and very personal. We really enjoyed having him as our driver and host. Thank you for a well planned trip. It was something I always wanted to do and never got around to it and at age 91 I decided I had better not postponed any more. You made our trip flow really smoothly.....Also, may I comment on our impeccable driving skills. You got us out of many tight situations that took great skills. I am glad that I entrusted you with my life and not anyone else!